What does it mean to be digitally literate? And who can actually answer that question today – teachers, administrators, researchers, students? I’m not sure I can do it justice. I think that’s one of my big takeaways from participating in the #etmooc Digital Literacy topic. I have been busier than I expected these past two weeks so I have not had a chance to follow the Twitter and Google+ dialogues very closely or read many blog posts and I am definitely feeling that lack. The amount of learning and questioning I’m prompted to engage in by participating with the group is a credit to the #etmooc community and I hope I’m able to dive back in more next week. 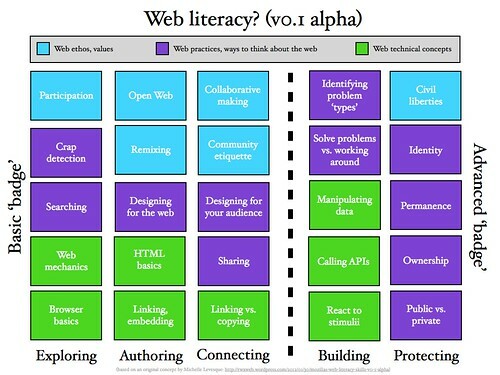 Still, from the archives I listened to and the one session I was able to attend (Howard Rheingold’s Literacies of Attention, Crap Detection, Participation, Collaboration & Network Know-How) live, I have come to realize that digital literacy or literacies is no simple topic. In part, this is because there are still disputes about how to define literacy itself and then there is the challenge of trying to define something that is constantly shifting and changing in response to technology developments and cultural shifts. Similar to the use of “21st Century Skills,” at what point do they just become “skills” or “literacies”? Do we need to distinguish between the digital aspects and the analog ones? And then there is the question of whether to differentiate between skills and literacies. 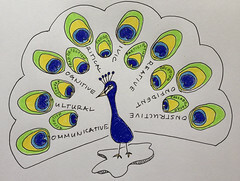 As Steve shares so well in this recent post, there are “nuances and emerging aspects of learning [specifically] through digital media.” I agree with the inherently contextual and cultural nature of (digital) literacies and the idea that while certain skills may be transferable between them (e.g., writing an email) the ways in which it is done can depend on the type of literacy used in that context. For example, when writing an email to a friend, young students might use very informal language or text speak but hopefully, when writing to teachers or professors, they code-switch to a more professional tone and different type of text and then they might have to adjust their practice again if they enter the workforce and learn the unique email protocols used there. I know I have found that in certain contexts, the expectation is that everyone at a conference or event will be tweeting and know how to converse in that type of 140 character, shortened URL code while at other conferences, I have to be aware that many people have never even seen a tweet and I need to be literate in other ways of communication to connect with them. As an educator, what I think is important for me and others to consider is whether our students are cognizant of the different types of digital literacies they already know, of the digital literacies they will need to know, and of the concept of digital literacies as a whole? In reflecting on the past two weeks, I realized that while my schedule was busier I was also a little less motivated to blog/participate because I felt there was less creation work and more analysis of deeper concepts that I needed to do to wrap my head around digital literacies. Honestly, I love to sit back and just think and reflect on ideas but when I’m pressed for time, it becomes a lot more challenging and I definitely felt like digital literacies required … requires … a lot more thought before I feel like I have a true grasp of it. So, my next project is to consider ways to create in order to better break apart and conceptualize digital literacies and then to consider projects that would be developmentally appropriate for my young students to create so they can begin to learn through this process too. When we were learning and sharing ideas about digital storytelling, I almost couldn’t resist posting multiple times during the week because I was having so much fun creating and learning and I wanted to share that with the #etmooc community. I’d like to find a way for that same level of excitement to be shared around digital literacies so that I can then invite my students into these engaging activities and open up an early dialogue with them about ways they can each define digital literacies for themselves.